Peaches are in season & we got raspberries in our last CSA delivery so Matt suggested I make a cupcake showcasing those flavors. 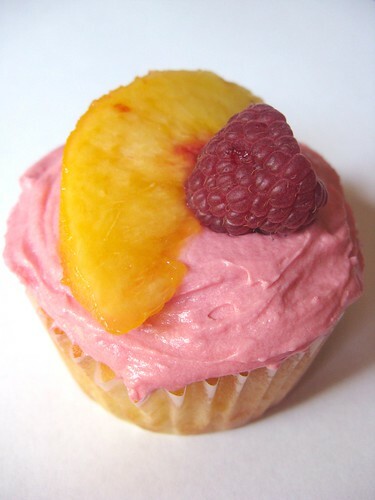 I've had trouble getting a good flavored peach cupcake in the past so I searched the web to see what others had done. 52 Cupcakes used a recipe from 125 Best Cupcake Recipes that sounded like it would be perfect so I used that. The only changes I made were to size it down & to use Peach Schnapps instead of vanilla. The cupcakes come out pretty interesting. They are very moist & have a lot of peach flavor thanks to the peach pieces in it. The peaches tended to sink to the bottom & made the cupcakes fall apart a bit when you are eating them. 52 Cupcakes said they are better the next day when the juices have really sunk in (we ate some this evening & they were better after sitting). The frosting is just a basic buttercream flavored & colored with raspberry coulis. The raspberry flavor is nice in this & the fresh raspberry on top really adds to the flavor as well. Preheat oven to 350 F. Prepare 6 muffin tins. Mix together the flour, baking powder, nutmeg & salt. Set aside. In a medium bowl beat the sugar & butter together. Add the egg & beat until light & fluffy. Add the peach schnapps & blend. Alternately beat in the flour mixture & the milk, making 3 additions of flour & 2 of the milk. Fold in the chunks of peach. Split the batter evenly between the tins. Bake for 35 - 28 minutes. The cupcakes will be very golden brown & the top should spring back when touched. Allow to cool on a rack completely before frosting. Put the raspberries into a fine sieve & push them through over a bowl. Leave seeds in the sieve. Scrap the bottom of the sieve to get any juice & pulp from it. In a small bowl cream the butter & salt until smooth. Alternately blend in the sugar & raspberry juices, beat until well combined. Beat in vanilla. Decorate with a slice of fresh peach & a raspberry. I love all of the cupcake flavors you always come up with! These are gorgeous, and I'm not sure I would have been able to wait until the next day to see if they were better! Looks great, I really love the picture. Peaches are so good right now, I bet they are even better in your cupcakes! They look awesome! Peach schnapps in a muffin - wow!!. Peach schnapps (Archers in particular) bring back memories of my teenage years!! It was MY drink until I discovered wine!! These are two of my favorite flavors, and it looks like this turned out great! Wow, these cupcakes are beauties! I would dissects this cupcake and eat it part by part, enjoying each component, yes i would! What a great use of the raspberries and peaches! They look and sound so delicious. Beth & I must have partied together in our past lives. 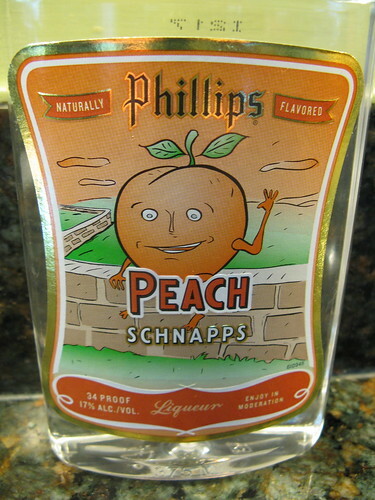 Schnapps always reminds me of underage drinking as well :) These cupcakes are much more sophisticated than those days. Looks delicious! Next time, if you coat your peaches in flour or a flour/cornstarch mixture, they might not sink to the bottom as bad. But if you enjoyed it, then nevermind! I remember those other peach cupcakes. I'm glad these turned out. They look cute. I know it's a little late but I just did a search in my search engine for Peach Melba and your link "popped up!" Thank you so much Kathy. It's posted. when i go at supermarket i make sure to by peach because i know all the benefits this fruit contain like strengthens the inmune system, control the nervous system, avoid anaemia and is very good for the cholesterol. That is why i prefer to eat peach frequently.